Latest post Fri, Jun 1 2018 7:50 AM by Pat Horridge. 6 replies. This is a spin-off from this discussion. after a few seconds (Source browser closed), and before doing anything else than inserting the unedited clips on an empty TL, I heard my laptop's fan start; I then looked at Task Manager: it reported 2 logical cores at a steady 95% utilization; absolutely no other sign of activity (no I/O to see with Resource Monitor, Background Services stopped, Matrox I/O physically disconnected, etc. 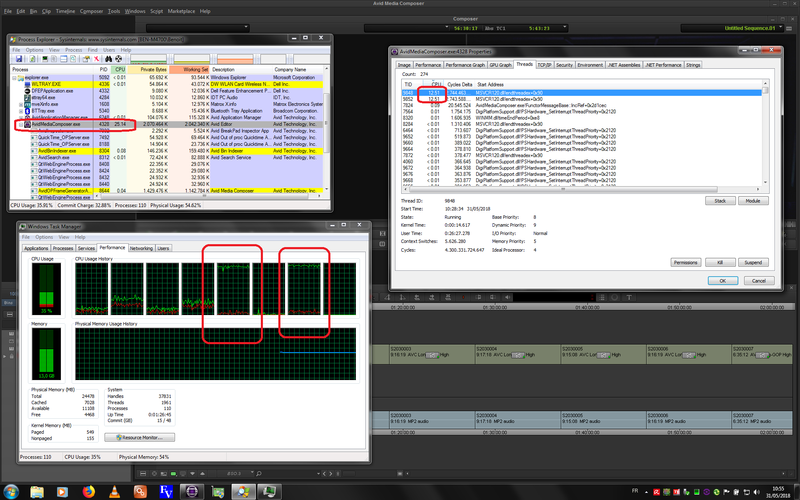 ); Process Explorer shows the 2 offending threads inside the AvidMediaComposer.exe process. After watching this for 15 minutes, I closed & restarted MC: as explained in the other discussion, exiting and restarting MC solves the problem...for a while. I'm curious to understand what causes this behaviour ? Are the offending threads just not ending gracefully after linking & loading the clips with Source Browser ??? Is this just another symptom of a now below-spec system (but playback of these clips goes just fine...) ? considering the 'age' of my system, is it worth entering a case, or is it wasted time for your engineers (and me ;-)) ? i had a case logged with Avid support, but becusae it was a non qualified system (see specs of my unit #2) it was not elevated to next engineering level. There are a number of possible processes thast could begoing on. One is creating audio waveforms. We expect them to be there and available but of course to make them Avid has to scan the whole of the source clip and build them. So loading sources will often create that. Sources that have the audio as interleaved with the video require a full decode to extract the audio information (so massively processor intensive) other formats that contain decreet Audio tracks can access the audio data easier. There maybe more as well. aVienna Yep I remember your PM, but not sure it's the same issue (this one has no background services involved) ? Sources that have the audio as interleaved with the video require a full decode to extract the audio information (so massively processor intensive) other formats that contain decreet Audio tracks can access the audio data easier. That sounds quite plausible (although wavefom display is disabled): considering the amount of data to process (about 2 hours of UHD MP4 - 60 GB), it could be well so that this process wasn't finished after 15 min when I decided to exit and reload MC. I would need to investigate why there was no visible I/O....perhaps a side effect of read caching and clever demuxing of the embedded audio. Have a look at the network tab and see if there is any activity there. If there is then it is likely to be the AMA working in the background. Don't forget even if waveforms aren't enabled they are still being calculated so they are ready. With Avid media audio is stored in a seperate MXF file(s) so access decoding and building wavforms is easy and low bandwidth. Its AMA linked sources that require decoding of the complete stream to access the audio that cause more CPU effort. An easy test would be to make a selection of AMA sources that have no audio tracks (can't just be mute as that would still be processed) then AMA and test.